GoGoGo Radio is one deceitful program that can enter your operating system without your knowledge. If you have found that this program was installed silently, you truly need no other reason to delete it from your operating system. Unfortunately, many users do not realize this, and, instead of deleting this advertisement-supported program, they believe it is okay to trust it. You should not be too surprised to learn that GoGoGo Radio is identified as adware because our guess is that suspicious pop-ups and banner ads started showing up as soon as this program was installed. This is the report you need to read if you want to find how to stop these ads and remove GoGoGo Radio from your operating system. Are you trying to delete GoGoGo Radio after installing it from an official-looking website? You probably are not. As mentioned previously, this program is usually installed in a silent manner bundled with other programs. Which other programs were installed onto your PC along with GoGoGo Radio? If you are not sure you can list all of them by yourself, especially since you now know that programs can be installed without permission, you should rely on software that will detect malware for you. SpyHunter is a reliable security tool that offers a free malware scanner. Click the Download link to install this tool and immediately inspect your operating system; otherwise, you will not know if you need to delete GoGoGo Radio-related threats. Some computer users do not even know that GoGoGo Radio is installed on their operating systems. If you are not fazed by the ads appearing on every site you visit, you will not know you need to remove GoGoGo Radio unless you check the list of installed programs or Task Manager Processes. GoRadioPlayer.Service.exe, GoRadio.exe, and GoRadioSvc.exe are the running processes that identify the existence of this adware. If you check the Task Manager, do not be surprised if you find processes that belong to WordFly, PC Optimizer, HQ Cinema, and similar programs that are known for traveling bundled with GoGoGo Radio. If you terminate these processes, they will restart the next time you restart your computer, which means that this is not a solution that could help you remove GoGoGo Radio-related ads for good. It is impossible to say what kind of content would be presented via ads injected by GoGoGo Radio. If you encounter malicious ads, you might be introduced to malware installers, phishing scams, and other kinds of unreliable content. Worst of it all is that you might interact with misleading ads and offers without even realizing it, because their creators might do a good job of concealing the real intentions. Needless to say, if you delete GoGoGo Radio, the risk of you interacting with malicious offers will disappear. If other ad-injecting programs exist on your PC, you need to remove them based on the same reasons. Unfortunately, we cannot say if you will be able to remove GoGoGo Radio-related adware and other infections using the same guide that will help you delete GoGoGo Radio itself. Luckily, a trustworthy malware remover can guarantee successful removal of all existing threats. Open the Start menu by clicking Start on the Taskbar. Click the Windows icon on the Taskbar and open Control Panel. 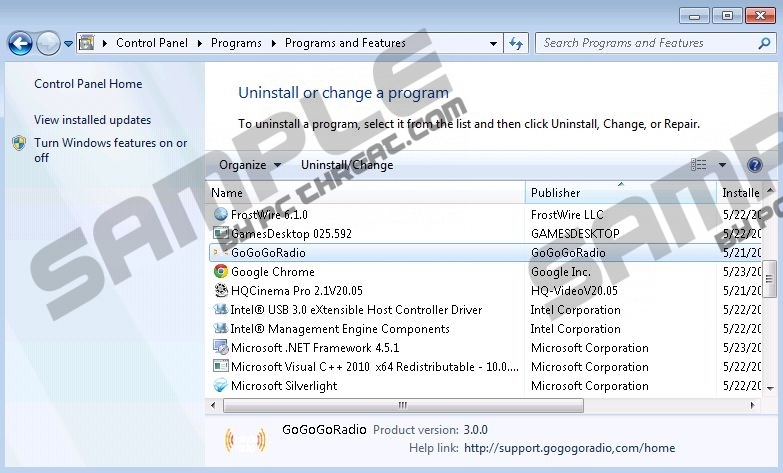 Move to Uninstall a program and identify GoGoGo Radio. Right-click the program you want to delete and click Uninstall. Move to the button-right corner of the screen in Metro UI to access the Charm bar. Click the Search icon, enter Uninstall a program, and open this utility. Quick & tested solution for GoGoGo Radio removal.